C.A.W. HVAC Company Inc is proud to serve the Freer community! 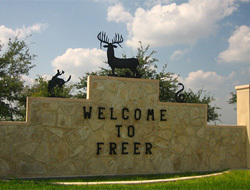 About Freer, TX - Happy to be your hometown Heating & Air Conditioning Contractor! Freer is a small town in Texas. With a population of just over 3,200, the area is well-known for its small-town, family charm, as well as its history dating back to the early 1800s. Public education services are provided by the Freer Independent School District and there is a local library. Colleges and universities in nearby cities provide continuing education. Freer holds a large festival called Freedomfest and there is an annual rattlesnake roundup every spring. Many events and activities can be enjoyed at the Freer Community Center. The climate in Freer is hot in the summer and mild in the winter, allowing outdoor events and activities to be enjoyed nearly year-round. It's a perfect small-town getaway from the hustle and bustle of the big city and has plenty of natural amenities for outdoor enjoyment.